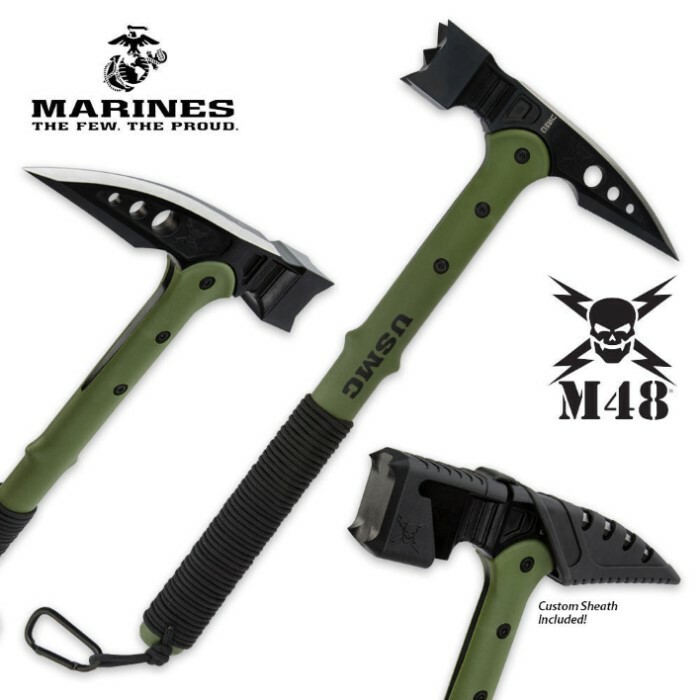 Officially Licensed USMC Tactical War Hammer With Sheath | BUDK.com - Knives & Swords At The Lowest Prices! 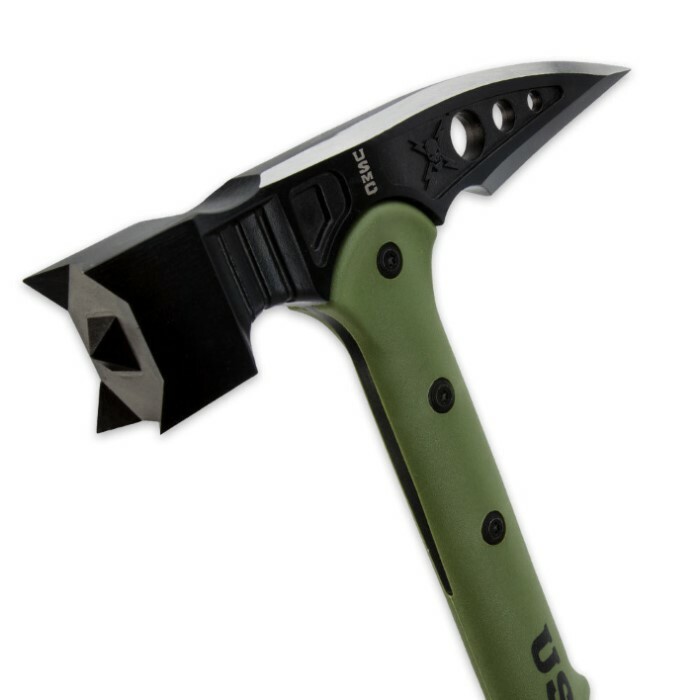 Brand new from United Cutlery is this Officially Licensed USMC Tactical War Hammer, built Marines strong with a powerful cast 2Cr13 steel head. The 7-3/4" head features a hefty hammer head that delivers devastating pummeling potential and a wide, upswept spike with a piercing point for supreme breaching and prying applications. The green handle is crafted of 30% fiberglass and reinforced nylon composite and attached to the head with three sturdy metal bolts for performance you can count on. The cord wrappings provide a secure, slip-free grip that won't let you down. 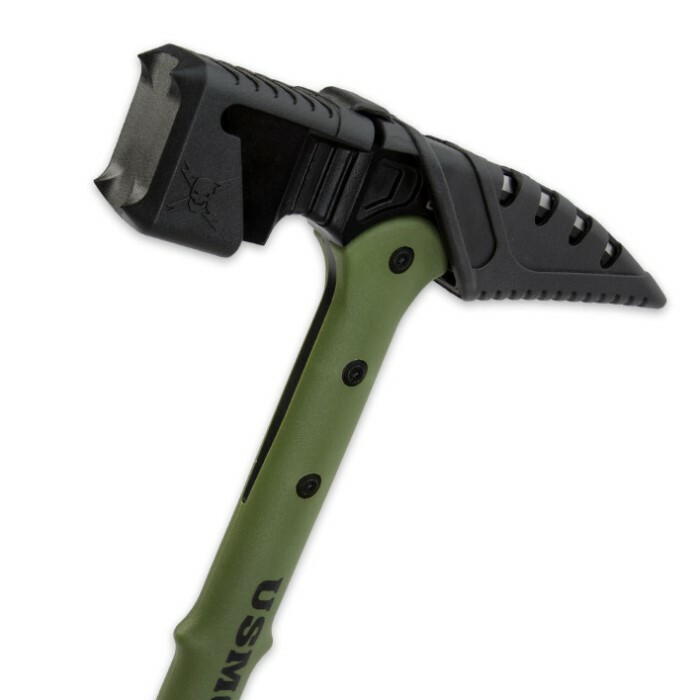 The Marines need a tool they can count on, and United Cutlery delivers in a big way with this USMC tactical war hammer. My only complaint about this tool is that it is finished in shiny black paint. I'm not asking for Cerakote(tm) on a fifty dollar item, just matte black. It Marine Crops authorized for crying out loud, you'd have though that would be a no brainer. Other than that it works just fine for what it is, a budget priced door opener.